Piping systems in industries, automobiles, locomotives, marine vessels form the circulation system for various fluids. Well thought out and efficiently laid piping systems help in reduction of space utilization for setup, increased accessibility, enhanced safety and easier maintenance. It is imperative to visualize piping layouts using CAD tools before installation for a specific purpose to garner above advantages. Piping systems being so critical for the desired operation of plants are subjected to different loads and stresses like pressure, temperature, vibrations and seismic conditions depending on the type of fluid, the temperature of the fluid and surrounding conditions. Considering these conditions, Outsource2india caters to customers' requirements pertaining to piping system validation and optimization through pipe stress analysis services. This is one of our key offerings which includes the conceptual and initial layout designing of the piping, both in 2D and 3D. We have the required skills and expertise to design piping systems for large structures including buildings, municipalities, marine vessels, biomedical industry structures, etc. 3D models of the piping system provide deep insights and help to make the required changes before the entire system is physically built. 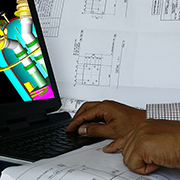 Our team can provide you with the best quality 3D modeling of the piping system and other equipment. We will create some of the most detailed drawings by making use of the conceptual layouts of the piping systems. The drawings made by our engineering team will help you to support your plant or utility layout, machinery design, or HVAC solution. Piping systems are subjected to a variety of extreme conditions of temperature and pressure. We can provide you with the best piping stress analysis for industries within a quick turnaround time. This will ensure reliability, safety, and also simulate the piping system's worst case scenarios. Once the design and drafting are complete, our team of engineers can provide you with the material take off services. This helps you determine the type of material is necessary for your designed system. Why Choose O2I for Piping Design and Drafting Services? Outsource2india has been a leading provider of piping design and drafting services in India as well as around the globe. We have been in the industry for over 20 years now and understand each of the client's requirements with ease and provide the services accordingly. Our team of engineers is up-to-date with the latest technologies and know-how to handle the most critical engineering drawings. We offer our clients with high-quality designs and drafts at highly competitive prices in the industry. If you are looking for a reliable, accurate, efficient, and cost-effective piping design and drafting service provider, then you have come to the right place. Get in touch with us today!